Residential solar power threatens profits at investor-owned utilities. Plain and simple. It’s also the most promising and readily deployable form of small-scale renewable energy. That’s why lawmakers in Maine are facing a significant pressure over a decision they face Wednesday, between two temporary schemes to value that solar power. Neither of the outcomes will settle the bigger battle that looms over how utilities and policymakers deal with the coming growth in solar and other technologies that allow for small power generators to pop up all over the state and all over the electric grid. Those customers get paid through a system called “net metering,” which allows customers to get credits for the kilowatt-hours of electricity they send out to the grid. The credits are good for up to a year. The fight has drawn heavy attention to rather wonky energy policy because of the money and environmental impacts at stake. Broader trends show the fight is hardly going away. Larger solar plants hint at the coming growth. In a guide to institutional investors, the World Economic Forum last year estimated solar power will cost less globally than coal or natural gas-fired generation by 2020. And last year, solar generation capacity grew by the largest amount on record in the United States, with the one-year total of new utility-scale solar more than doubling the capacity built through the end of 2013, according to the U.S. Energy Information Administration. A study for the U.S. Department of Energy published in April by the Berkeley National Laboratory estimates the trouble net metering and energy efficiency programs pose for utilities in the Northeast. While New England utilities don’t generate electricity, some of their revenue is tied to how much power customers use. Technology like small-scale solar blurs that relationship. In some cases, it reduces the end-user’s reliance on power transported from generators far away. At other times, it makes the customer an actual supplier of electricity to the grid. Utilities are worried about solar power growing under that system, particularly as net metering is a long-term commitment. The plans before lawmakers Wednesday both allow new residential customers to lock in net metering arrangements — which decrease in value annually — for 15 years from the installation. The Berkeley study modeled that risk for a Northeastern utility, estimating the impact that aggressive energy efficiency investments and small-scale solar deployment would have on revenue. The study found the combination stands to reduce utility earnings by 24 percent over 20 years while driving up the unit price of power, if regulators don’t break or change the link between utility revenues and electricity consumption. Central Maine Power Co.’s rates that took effect in 2014 include such a thing, called a “revenue decoupling mechanism,” referring to the “decoupling” of utility revenues and power consumption. The company can adjust distribution rates in a future year — to a point — if they fall short. John Carroll, a spokesman for CMP, said that change sought to prevent the utility’s business model from running counter to public policy goals of increasing energy efficiency, conservation and other changes like small-scale solar that reduce power consumption. The study found efficiency and solar adoption also stand to hit the utility’s long-term bottom line, if those small generation projects defer the need for new power lines that are the bread and butter of large utilities. That’s a big threat to utilities reporting to investors who expect steady earnings, which the Washington Post reported in 2015 prompted a renewed push against net metering and solar power incentives in state legislatures and state utilities commissions across the country. The initial fight sought to raise rates on solar customers, the Post reported, referring to conflicts of the kind that brewed in Maine in 2014. The disputes over solar power have continued to simmer in the meantime, which has meant a relatively heavy dose of lobbying in Maine, too. State records make it impossible to put a specific number on how much companies spent to lobby on any particular bill (lobbyists only itemize compensation per bill when monthly expenditures top $1,000), but records reveal who’s involved in the latest solar fight. In total, 18 clients paid 19 lobbyists at least $34,800 to work on the issue, adjusting for the number of bills for which each client has hired lobbyists in the last year. The number likely undercounts the total spend on the bill as the dollar figures only include payments to the specific lobbyist working on the solar bill while the total number of bills includes all of any client’s lobbying activity. For instance, the Industrial Energy Consumer Group disclosed $18,113 in lobbying on the solar bill alone in June. The fight over solar policy in Maine almost subsided in 2016 when lawmakers passed a plan to move on from net metering. It fell, by one vote, to a veto from Gov. Paul LePage. The failure of that bill set the stage for regulators to step in and modify the net metering rules they first put in place in the 1980s. 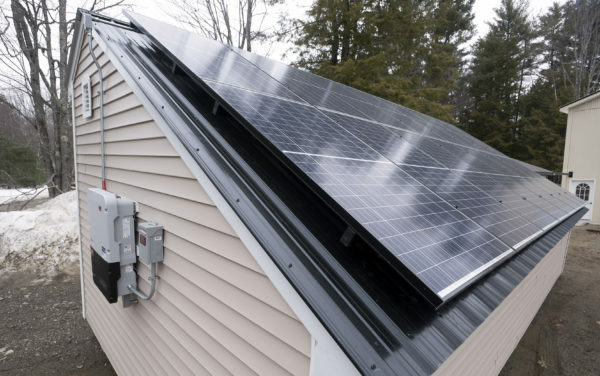 They opted to gradually reduce incentives for small solar owners, prompting criticism from LePage that the measure didn’t go far enough and opposition from the solar industry who said it went too far. Central Maine Power Co., which publicly supported the failed 2016 compromise, has since come out in favor of leaving in place the PUC rules and sustaining LePage’s veto of a bill that would tweak those rules. Sara Burns, CMP’s president and CEO, called regulators’ proposal an “equitable transition away from the net metering subsidy” in an opinion article in the Portland Press Herald. But the decision on whether to sustain the veto is, in the longer term, a decision on the direction in which to kick the can. Both options gradually draw down subsidies for solar power. The vetoed bill directs the PUC to begin studying ways to eliminate net metering and propose alternatives to lawmakers by the end of 2018. The PUC rules call for the policy to come up for another review when solar installations grow to 3 percent of a utility’s peak demand, which Maine’s previous public advocate wrote could happen as early as 2018.